“We are seeing light at the end of the tunnel,” Marchionne said. Fiat S.p.A. CEO Sergio Marchionne lifted his outlook for the European new-car market this year, as well as his forecast for Fiat's global sales. Fiat now expects total market sales in the 27 EU markets plus Iceland, Norway and Switzerland to fall about 10 percent to 13.25 million, compared with its April forecast of a 15 percent decline. In 2009, European sales fell 1.6 percent to 14.72 million, according to industry association ACEA. “We are seeing light at the end of the tunnel,” Marchionne told analysts on a conference call Wednesday. He said commercial vehicles are already showing signs of recovery. Marchionne's new prediction is aligned with other major European automakers, which had forecast a sales slide in 2010 of between 7 percent and 10 percent. Fiat now expects to sell more than 2 million vehicles globally this year, helped by a stronger than expected European market. The Italian automaker sold 2.15 million units worldwide last year and its previous forecast was for 1.93 million sales in 2010. Marchionne said Fiat expects the Brazilian market to grow 2 percent this year, after a positive first half with sales up 3.2 percent to 1.2 million units. Fiat aims to retain its no. 1 position in Brazil, where it has a 23.3 percent market share in passenger car and light commercial vehicle sales. In the first half, Fiat's global sales grew 2.7 percent to 1.09 million units. Passenger car sales fell 2.5 percent to 891,000, while light commercial vehicle volume grew 36.2 percent to 194,000. 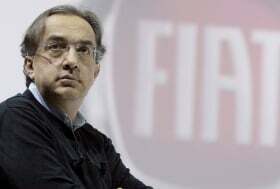 Sales of light commercial vehicles offer Fiat higher transaction prices and higher margins than passenger cars, Marchionne said.